Woke up with the smell of dried up electrode gel in my hair… my body felt weary but my mind was on fire and humming with thoughts and conclusions about the experiment I had concluded just the previous night. I had emerged from a 3-hour long EEG recording session, during which I meditated so deeply, I felt I was one with the Machine. 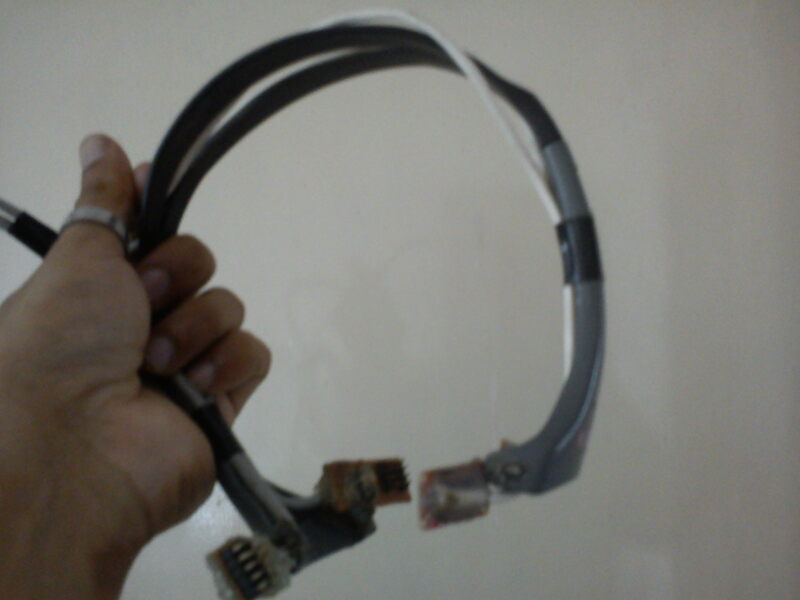 There were points at which I was in harmony with my EEG headset that I had built and upgraded over the years.. it felt strange and exciting at the same time. Anyone who has built their own equipment and actively experimented with EEG, Neuro-feedback and/or BCI may know what I’m talking about. When you work intimately with electronic devices (especially those you’ve built or put together) that provide you with audio or visual feedback of your own bio-rhythms (in this case, one’s own brainwaves), there are times when you’ll notice how the waves from each hemisphere come together in harmony, even if ever so briefly. And you feel the thrill of knowing that you can spot and identify those moments with the help of your recording equipment. When there’s this constant flow of information that gives you a picture of your own brain’s inner activity, your thoughts and recognition of it further strengthens it, thereby establishing a neuro/cognitive-electronic feedback loop. And those sparks of utter clarity and mini epiphanies are what we neuro-freaks live for. I’ll get into the technicalities of the session in a while, but this is not going to be a purely objective report of what occurred. There are MANY philosophical implications and conclusions I arrived at while I was in that meditative state, and they are based on MY observations of various subtleties that one experiences in such a state while being hooked up to your EEG setup. So, feel free to take my thoughts with a huge grain of salt. Suffice to say, I’m extremely proud of this headset I constructed.. and I’m thankful to both OpenEEG and OpenBCI for all the great work they’ve done to make such circuitry and equipment easily accessible to those of us who truly wish to build devices to help us understand the inner workings of our own brains. THIS is as cyberpunk as it gets, atleast AFAIK in the local DIY electronics scene in my corner of the world. 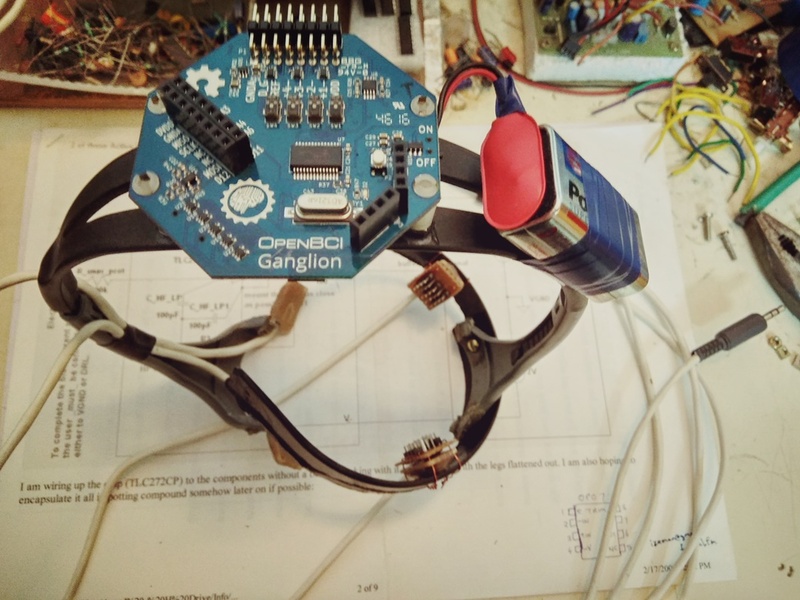 The beauty of OpenBCI’s design astounds me and I’m SO impressed with what you can record with this board: 4 EEG channels + Accelerometer data, and you are not limited to recording only EEG data, you can also use it for ECG or EMG recordings as well! 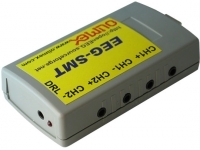 And since it has Bluetooth-LE onboard, that means you can wirelessly transmit your EEG data straight to your system. And OpenBCI’s software is just as impressive, not only does it stream raw EEG data in real-time for FREE (Emotiv & NeuroSky, you could learn a thing or two from these guys! ), but you can also monitor the Accelerometer (which detects 3-dimensional movement of the head) AND the software also has an Electrode Impedance checking section to boot! The Impedance checker is VERY handy, helps you to figure out if any of the electrodes are sitting loosely or if they require more gel to be added, etc. 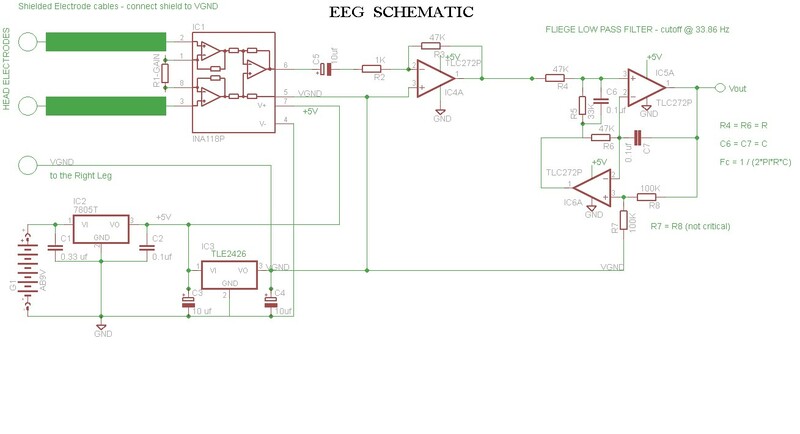 So now, my EEG headset is a mixed EEG system and allows a total 6 channels (4 from OpenBCI + 2 from OpenEEG/my circuit). 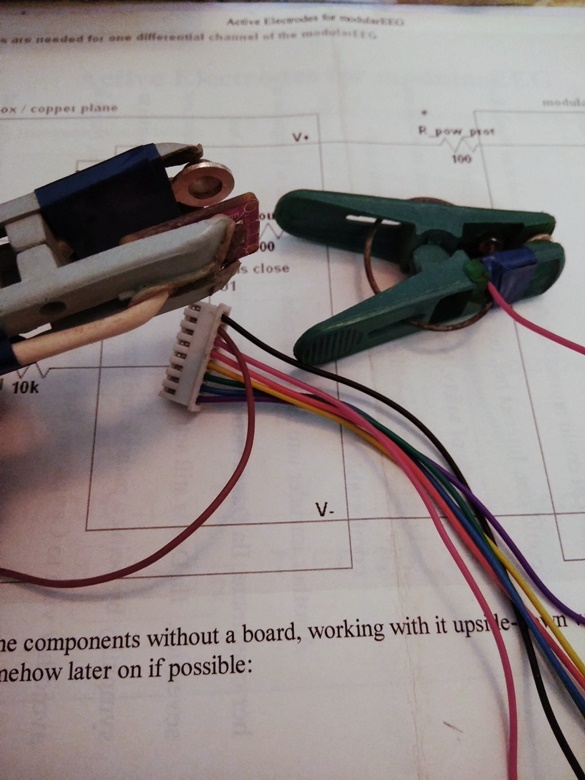 The trick to combining both systems seamlessly is to ensure that both systems share the same floating Driven Ground (i.e., the DRL in usual parlance) and the way I achieved this was to build a couple of earclip electrodes… from clothes pegs! 😀 I combined the pegs with pure silver electrodes that I got made especially for this purpose and they work extremely well, even without electrode gel! 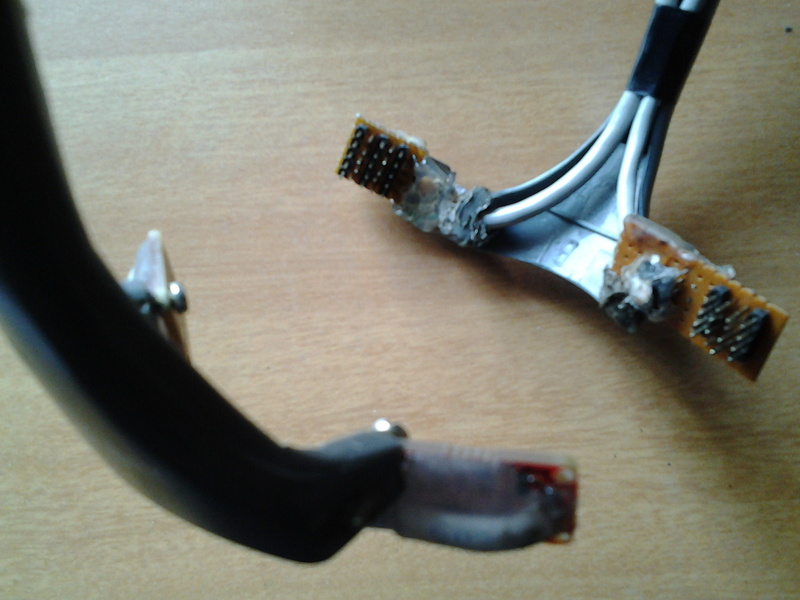 So, one of the earclip electrodes acts as the Reference electrode (I used it on the left earlobe). And with the other earclip, I’ve sandwiched the right earlobe between two DR electrodes, i.e., combined both Driven Grounds so that the DRL electrode from OpenEEG sits on one side of the earlobe while the other side is covered by the Driven GND from OpenBCI. This way, both systems will share the same Driven Ground, thereby ensuring that all readings are correctly recorded with respect to the established common reference. To record data from the Ganglion, I’d need the Bluetooth CSR dongle for OpenBCI, which interfaces well with their open-source software, whereas with my old circuit / Olimex, all recording takes place through a USB cable. So far, the readings I’ve taken from both sets of electrodes and systems look great (except for one channel but I’ll have to look into that). I’ll add more info and pictures the next time I take an EEG recording with my new & improved OpenBCI/EEG Headset. Ciao for now! 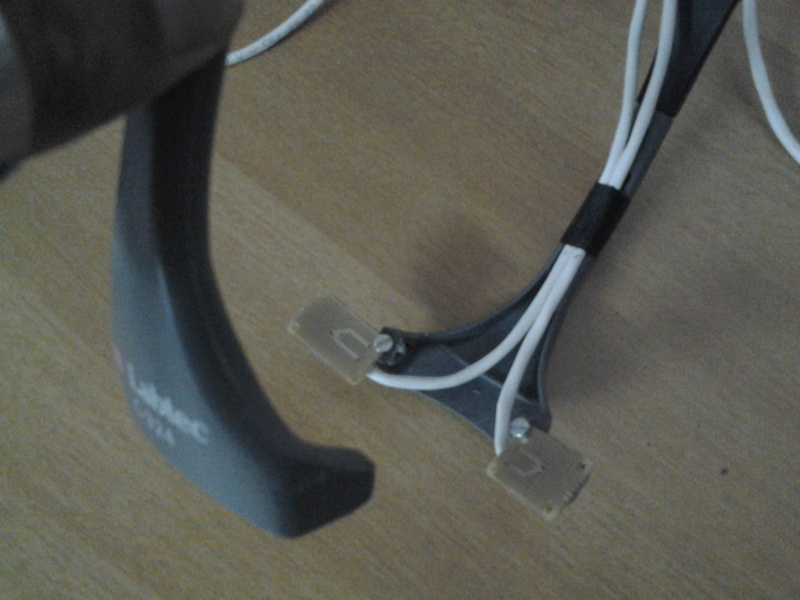 This took me a while to get around to but I finally constructed an EEG headset for my neuro-feedback experiments. 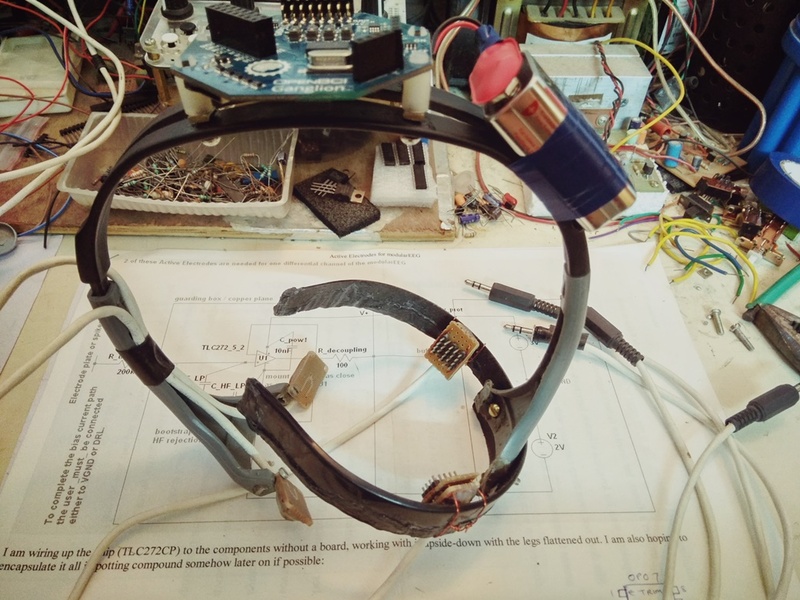 Took an old pair of headphones and converted it into my headset, using a pair of active electrodes I built (based on the concept and design shared at the OpenEEG project) as well as passive electrodes from olimex. The advantage of implementing active electrodes in this headset is that you do not have to apply any electrode gel, plus it’s useful because the gold-plated pin array helps to get past hair and maintain contact with the scalp at the back of your head (occipital region). The passive electrodes work fine as they are, coz they sit comfortably on the forehead just above the eyebrows (frontal ridge); again, no gel needed. If you choose to construct a headset like this with an active+passive electrode combo for each channel, then you will have to match the output signal levels between the electrodes in each set (i.e., between active and passive on the Left and then Right). The active electrodes are more sensitive to movement artifacts but they have better noise rejection since each active has the gain amplifier on board (I didnt have the time or inclination to experiment further, but I’m sure it will be much better if you construct active electrodes with SMD components). If any of y’all construct a similar headset of your own, feel free to share your photos & comments! It’s been years since I posted anything new. So many projects have come & gone, but I still return to my neurofeedback favorite from time to time. 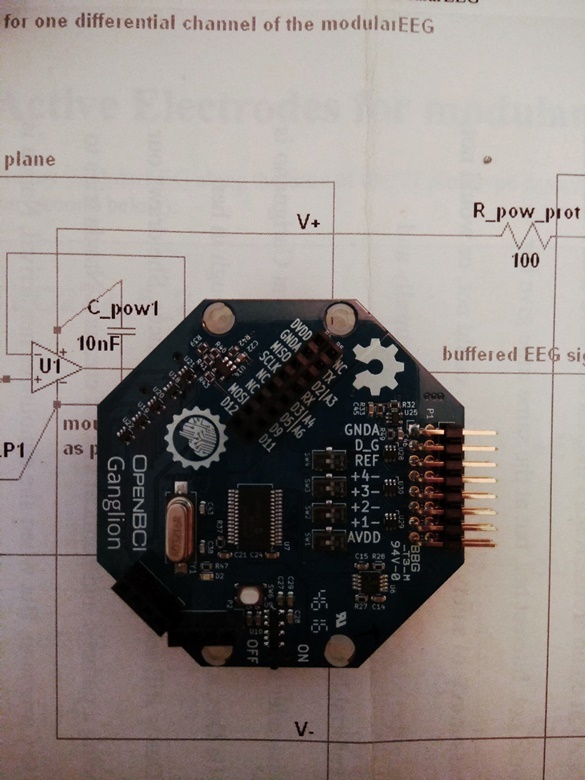 In addition to my own circuitry, I recently acquired this neat & simple, 2-channel EEG-SMT device from Olimex. Why doncha PIC on someone yer own size! …In the meanwhile, I was also working on setting up a decent Serial Data Logger (opto-isolated, no less). Can’t mess around with your life when it comes to recording bio-signals… so the best way to go is definitely optoisolation. Anyways, I played around with the 8 bit, 8 channel ADC 0809 coupled with the USART 6402 and MAX232 plus 6N139 (for the optoisolation of course). It was all a miserably failed attempt. 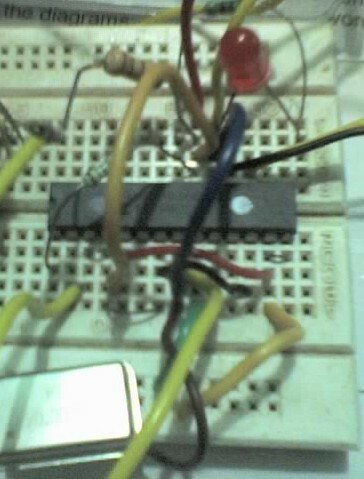 And I’m glad it failed… coz I found an easier way to get the signals logged. Enter PIC 16F73 (or 76 or 876… you take your PIC 😉 ) . 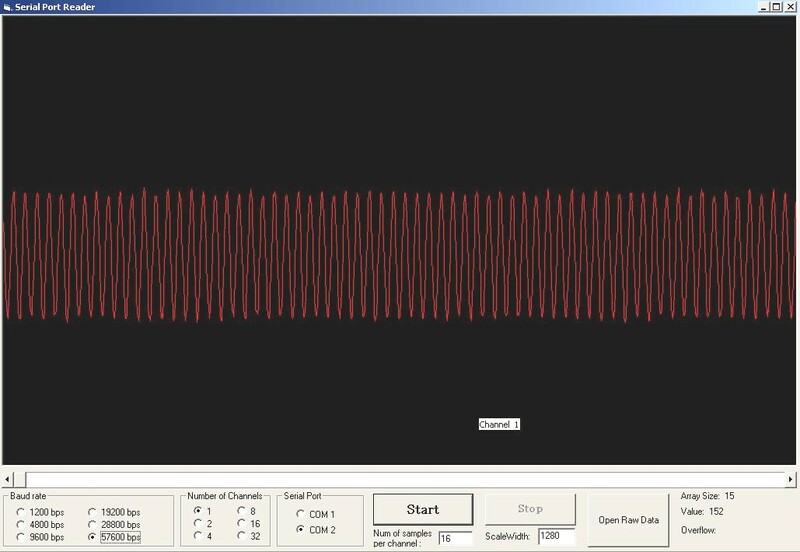 I had already created a custom-made Serial Data Logger software in Visual Basic and it was designed for 8 bit sampling ranging from 1200 bps to 57600 bps. I didn’t want to rewrite the code for 10 bit sampling, so I just stuck with the 16F7X series instead of the 87X series. Well, once you decide on your PIC, you obviously need to have a programmer. Prior to this, I made a cute l’il programmer for 16F628A, but it wasn’t a generic programmer… so I had to build another one from scratch. Note: There is a small correction to be made in the schematic at Link1. The Drain and Source of the MOSFET as shown in the diagram need to be reversed. I learnt this the hard way. Everything else in the schematic is A-OK.
After plenty of coding an recoding and tweaking and twisting, I finally managed to get a decent output from the PIC. Since it has an inbuilt ADC as well as a UART, it made my job MUCH easier. The only thing I had to get was a 20 Mhz crystal to run the PIC, but after that, everything just worked perfectly (almost… still get a couple of glitches in the output… will have to iron them out soon). The beauty about this software i wrote is the flexibility. My favorite part is choosing the number of channels… a corresponding number of data display frames are automatically created and I can view each multiplexed channel separately in its own frame. Here’s a picture of the Opto-isolation section of the Data Logger circuit. You can’t see the chips clearly, but those are MAX232 and 6N139 along with 7805 for power supply regulation. On the output side of the 6N139, the MAX232 and 6N139 are powered by a cable that runs directly from my PC’s own power supply. 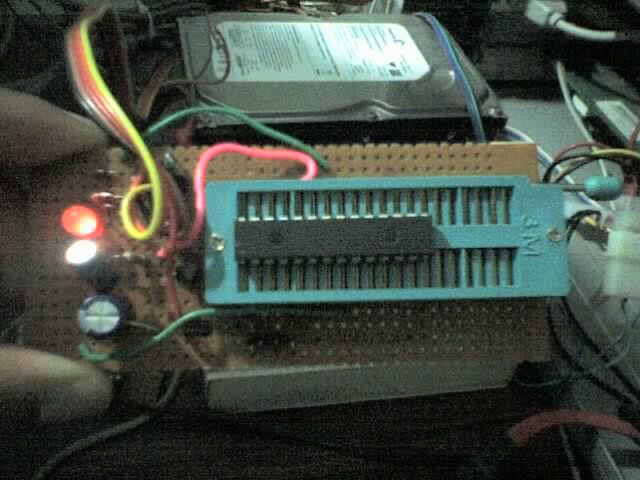 I used the 9V terminal from the PC supply and regulated it with 7805. 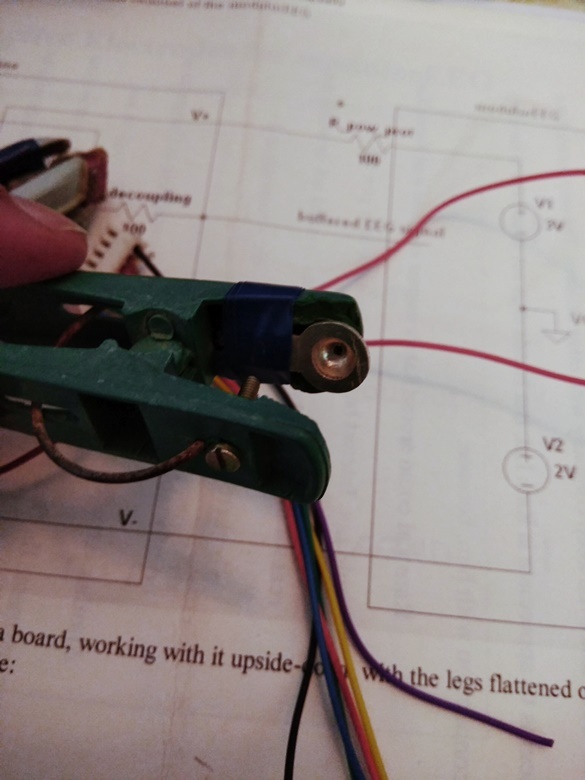 If you dont wanna use the regulator, you could always use the 5V terminal from your PC’s power supply connectors instead. 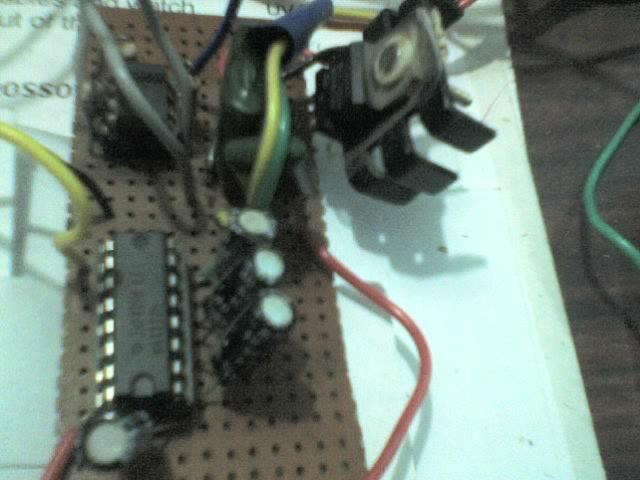 On the input side of the 6N139, everything is powered by a 9V battery (regulated to 5V by another 7805). This ensures that your bio-signal end is galvanically separated from your PC. Filter, o Filter… where art thou? Back to the 5 stage butterworth Sallen-Key stuff… Played around with different variations to see if I could get a decent result. My aim, as stated before, is to simply reduce all the frequencies above 50 Hz. Not really interested in experimenting with High Gamma brainwave frequencies as of now. I managed to arrive at a good Sallen-Key setup… will post the component values and the calibration scope results in a while. Until then, Ciao!